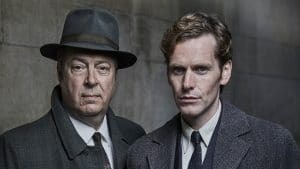 Shaun Evans returns as the cerebral and solitary Detective Constable Morse in the anticipated fourth season of Endeavour on Masterpiece. The season airs Sundays, August 20 – September 10, 2017 at 9 p.m. on CPTV. In Season 4, it’s the summer of 1967, and the effects of the Cold War and ’60s counterculture are being felt in Oxford. It has barely been two weeks since the events depicted in the Season 3 finale, and we find Oxford’s finest picking up the pieces of their personal and professional lives. Endeavour waits to hear the result of his Sergeant’s Exam, and self-medicates to numb his heartache over Joan, but whisky and Tännhauser will only get a man so far. Meanwhile, Thursday and Win deal with their own sense of grief. Their home is empty, Sam gone to the Army and Joan… who knows where? To see a preview of Season 4, click here.